Pogostemon sp. 'Kimberley' is very similar to the stellatus species. Pogostemon Kimberley has larger leaves and they get a darker red. 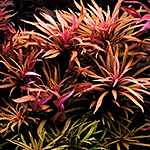 This is a larger plant and suited for background use in medium to large aquariums. A very attractive stem plant that grows large but can be trimmed to keep it within the parameters you wish.